Our local version of green salad, the ensaladang Pinoy is equally healthy as its foreign favorite garden salad counterpart. And like any other garden salad, the ingredients can easily be picked from your backyard garden. But unlike the foreigners’ taste palettes, we Filipinos like our green salads with a pinch of salty flavor. Like any other garden salad, it’s organic and healthy. 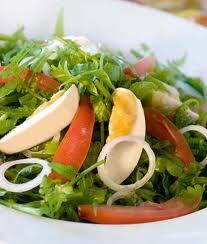 We Filipinos want to try any and every vegetables to make an ensalada. There is the ensaladang ampalaya for a bitter taste, the ensaladang talong one of the common ensalda you can enjoy even if you are eating in a turo turo. In this healthy recipe, we will use the very nutrition packed little leaves of malunggay and kangkong. As you mix the vegetables, pour in the dressing mixture. Add the chopped kinchay for additional aroma.